At the very least, it makes my scalp itch. Yes, ladies and gentlemen, lice. The mere mention of the word causes a tingling in my scalp that begs to be itched and combed and gone through strand by strand. We are lucky in our house to have never been inflicted with lice. I remember when the first notice about exposure to lice came to our house when Eldest was in first or second grade. Gross! Someone in his class has lice? Ewwwwww! What kind of school was this purportedly great school? Where, exactly, did these students come from? What conditions did they live in? As it turns out, all totally typical reactions and all utterly stereotypical ones. Of course, we've received a dozen such notices over the course of 15 combined school years for the three kids. Youngest's first grade class has remain unscathed -- or unscabbed, should I say -- but the three other first grade classes have continual lice issues. For three solid months, notices have been sent home to the parents of those kids at least once a week. They're saying it's not just the same kid(s) over and over. 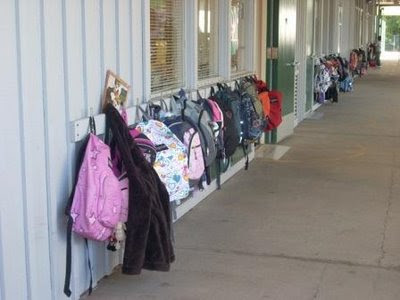 All I know is I'm totally icked-out over the whole thing, especially since they told us on Friday that they would put plastic bags on the hooks for the kids to put their lunch bags and jackets and work in. No backpacks allowed. No hats allowed. And this is for all of the first grade, not just the three infected classes. So, even though Youngest's class is nit-free, presumably, the same rules apply to him. What don't we just call the kids a bunch of trash and throw them away with the rest of the garbage? They are the cootie-kids. They are dirty. They have -- GASP -- lice. ooohhh... now I will be feeling itchy all day. EWww. Time to break out the Haz-Mat gear for the kids to wear to school. Do 'super lice' have itty bitty capes? At least they put the backpacks, etc in bags. Better than our school! And, we don't get notified. How about that? :::knock on wood::: I haven't heard of a true outbreak in a few years. The worst was also my daughter's 1st grade class. And, sadly, her class was affected. It was Horrible!!!!! And lasted months because one of the offender's moms didn't realize that she needed special shampoo. She kept sending her child to school infected. Lovely. Lice is one of my biggest phobias. I know it is totally irrational but they scare the heebie jeebies out of me. I am glad you have never gotten them and I am hoping I never get them either. Wow! That definitely makes my skin crawl as well. I've heard of a few outbreaks here as well. I hope that we will have the same lice karma that you've had. Really? Do the plastic bags make a difference? I've never heard of that doing anything. I didn't even bother washing the kids sheets especially either - just conditioner and combing worked for us. Chemicals should be avoided - they create those super lice in the first place. It seems a LOT worse before your kids get them and then you realise there are A HEAP of people in that same boat with you. You make me laugh every time I read your blog. So Funny! Oh mt god that is a great set of photos. We had a flea infestation a few years back from the cats. It was horrible. We had to bomb the house. 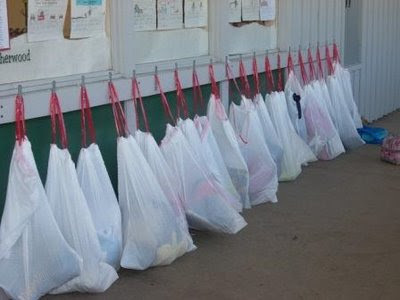 We've, I mean my daughters, have had lice about ten times between them and have never had to put items in plastic bags at school...especially outside. Weird! So glad you have never had the pleasure of soaking your child's head in mayonnaise, Cetaphil or using some lawn pesticide on their scalp. It really is a pleasure.